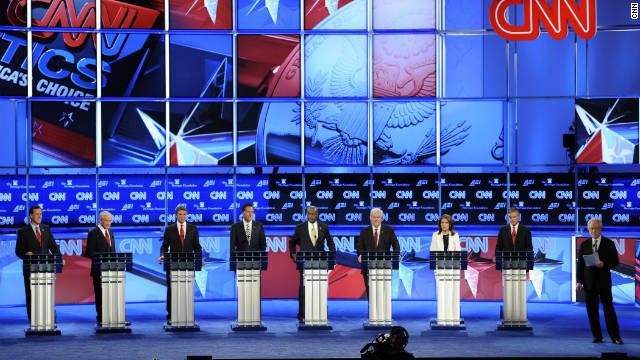 Eight major GOP presidential candidates met in Washington on Tuesday for the CNN National Security Debate. Editor's note: This post is part of the "Overheard on CNN.com" series, a regular feature that examines interesting comments and thought-provoking conversations posted by the community. Share your debate reaction on CNN iReport and in the comments area below. Several key divergence points between the GOP candidates emerged Tuesday night during the CNN-sponsored national security and foreign policy debate. The debate was spirited, but who can you believe? That's a question both CNN analysts and our own readers have been trying to answer. Who can you believe at GOP debates? Debate coach Todd Graham once again evaluated the candidates in this opinion piece that evaluates the debate. Commenters and iReporters responded with some interesting critiques of some of the candidates. Many analysts said Newt Gingrich gave a strong performance, with nuanced arguments and confident defenses of potentially unpopular positions on spending and illegal immigration, but commenters seemed a bit ambivalent about him. joeinalabama: Newt has a lot of baggage, but I think he has a better grasp of how the world works than the rest of them, including Barack Obama. TxJim: "Newt makes so much sense. Over and over and over again. Very smart man. Just completely devoid of any credibility and totally unelectable." thestocks: "Newt is a very smart man. I think he has too many skeletons in his closet, and too many instances in his past when he supported the liberal spending policies of George W. Bush." Ron Paul, on the other hand, advocated a libertarian stance that set him apart from the GOP candidates, analysts say. Paul is known for having a very devoted following, particularly online (the CNN.com comments section is no exception), and several readers wrote to share their support of him. firehawktt: "I was impressed with Ron Paul in this debate. The U.S. should not be the world police. We should not interfere in every foreign conflict out there. Here you had the other candidates attacking Obama for not putting a no fly zone in Syria or Iran. We're already in Iraq, Afghanistan, and Libya, and these guys want us to get involved in more wars?" columbridae: "As much as I hate to admit it, Ron Paul came off as very intelligent last night. He still has unrealistic ideas, but he knows his facts. ... I don't think his extreme liberty policies can survive when there is so much corruption and greed; they would be good ideas if businesses could be trusted to not do bad things." Sphy: "Huntsman won on credibility by a landslide. Romney just oozes insincerity. You can tell he's pandering to Republicans and doesn't believe half the positions he seems to be selling." But if you think that you can escape from the three-ring electoral circus by moving to some other country, you might want to think again. ejr1953: You really can't believe any of them. Politics in America is the game of the politician figuring out what most people want to hear, feeding their pre-conceived notions about how things should be in the world, making statements to get more people to vote for them vs. the other candidates. Roscoe55: Not just in America my friend, things are just the same here in the UK. Politicians get elected on one set of promises and forget all about them once they get in power. Join the conversation about the debate in the comments area below and in the latest stories on CNN.com. Or share your opinion on video via CNN iReport. In this crowd, it seems that Ron Paul and Newt Gingrich have the market cornered on keen intellect. As for the others, many who have proclaimed that 'God' told them to run for president, we are left wanting for serious brainpower. Of great concern, are those who consider Rick Perry a serious contender, as he actually appears more inarticulate than another Texan who occupied the White House for 8 long years. When the people, of the 'of the people, by the people, for the people ilk, evolve to the point to desire someone smarter than themselves to run for office, perhaps then we can start to get serious about world leadership and humanity again. Huntsman and Paul have it right – our greatest threat is the debt. Yet, most of these so called deficit reducers want to build a fence on our southern border, and draw us into a war in Iran. When the question was asked if we would back Israel should they decide to attack Iran, the others indicated they would support the Israel initiative. So now we allow Israel to determine our military policy. Or, is this just the military industrial complex at work. The war machine helped drive us into debt. Fist fix our problems at home before we put ourselves into another costly war. I will be voting for Governor Gary Johnson! Pro-Choice, Pro-Gay rights, Anti war GOP candidate who wants to balance the budget and legalize marijuana! Johnson is also a good steward of tax dollars. He came into office with a huge deficit and left 8 yrs later with a billion dollar surplus. His staff once asked him how he wanted his name read on the state welcome signs. He said Don't put my name on those signs, If we change them at all put welcome to New Mexico from the citizens of New Mexico so we dont have to spend money to change them in the future. As Governor he raised the speed limit to 75 on the highway and allowed people to buy beer on Sunday saying "this is a choice the people of New Mexico can make for themselves and don't need the govt telling them on what day they can buy beer." He understand the proper role of govt to protect you from force or fraud but to otherwise leave you alone unless your actions interfere with the rights of another. Check out Two term(one more than Mitt) Governor Gary Johnson! Dont let the media pick your candidate! Johnson's socially liberal and fiscally conservative stances will be attractive to democrat and independent voters in the general election, I think he is the man to beat obummer.. Gary Johnson is who we need in the White House. The People's President! In my 54 years on this earth, I have never seen a more ignorant, unqualified, hypocritical bunch of Presiidential candidates. They are an embarrassment. I can just imagine what other countries think of our political system about now. I have voted for both parties, since being of legal age to vote, so it's not so much my political affiliation, it is that one of these people may actually be our Commander in Chiief. Are the American public really this ignorant to what these people are saying, or not saying? Are they not humiliated by the sheer stupidity of these candidates? Would anyone actually trust one of them to carry the "Nuclear suitcase'? At a time when we are supposed to be tired of the same old political crap in Washington, these candidates are so far out in right field and partisan, that they display exactly what I thought we were trying to eliminate. I see absolutely no genuine concern for our country, by any of the candidates, but maybe Ron Paul, who is at least consistent with his policies and actually sounds educated and having an understanding of the real world. I wouldn't vote for him, but I do respect his consitency, despite his policies not falling in line with the overwhelming Christian influence in the party. I agree with whoever said that Obama merely needs to air segments of these debates, as his campaign ads. I mean, comedians are never going to be short of material as long as any of these candidates are in the running. I hope this isn't a true reflection of how the American people think. If so, God help us all! its sad that the media is ignoring Ron Paul. I use to be a Die-Hard Obama supporter. I hated everyone who hated or disagree with him. But after watching candidates like Ron Paul speaking at debates and him speaking at town hall, i think he is the ONLY smartest candidate that can beat Obama.. Ron Paul speaks like a true professional, he dosen't stutter or think for a long time when he speaks. He already knows what to say when someone asks him a question. TRUST me people, listen to this candidate more, u may like what he says. HUNTSMAN ONLY CREDIBLE CANDIDATE SIMPLY BECAUSE HE DID NOT SIGN THAT STUPID ANTI-TAX PLEDGE, AND THEREBY NO LIMITING WHAT METHODS CAN BE USED IN ANY CASE. Our Government Parties Not so political they are more like a social gathering to enjoy themselves making us Citizens look like Fools !